I’m pretty sure I’m the only person in the room who isn’t accompanying children. The awaiting audience are chatty and excited. The child behind me already knows what most of the fossils on the table awaiting description are. “Baryonyx claw!” is exclaimed. “What is the word for fossil poo?” encourages dad. “Coprolite!” the excited boy declares loudly. 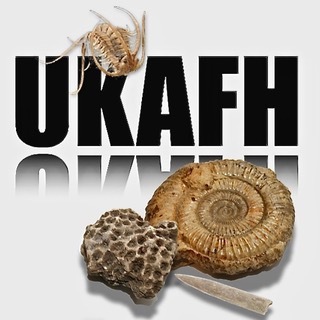 It is Friday 2nd February and palaeontologist and UKAFH patron Dean Lomax is about to take us on a journey back to the amazing British finds that sparked the original dinomania in the 1800s. From the ‘invention’ of dinosaurs to the great granddad of T. rex, he reveals British dinosaur and ichthyosaur discoveries, including recent identifications of new species and some incredibly rare finds. The Royal Institution event, Jurassic Britain: Rediscovering dinosaurs and ichthyosaurs, welcomed all ages but was specifically aimed at ages 7+. These are children who know their dinosaurs and who, with encouragement for and enrichment of their passion, might become the next generation of palaeontologists. Dean begins thus: Before Jurassic World and Jurassic Park was Jurassic Britain. This inspired him as a child to pursue palaeontology as a career. And it’s been quite a career so far, including authoring the outstanding book, Dinosaurs of the British Isles, along with Dr Nobumichi Tamura, on which this talk draws. Dean captivates his audience with tales of Victorian gentlemen and scholars who strove to understand and describe the mysterious fossil bones that were being discovered, which were found to have some similarity to lizards and led to the term “dinosaur” being coined by Dr Richard Owen in 1842. Yes, dinosaurs are a British invention! Indeed, the first three dinosaurs ever described were British and because we were at the forefront of this new science as well as possessing a large number of dinosaur fossils, Britain had a good many “firsts’ in the record books of dinosaur discovery. Our unique geology means that around 60 dinosaur species are known in Britain from across the whole of the Mesozoic era, making up over 4% of all dinosaurs. Dean talked us through the timeline of momentous discoveries, amply illustrated with images, artists’ reconstructions, video footage, genuine and replica specimens and visualiser displays. It has been quite a journey from Victorian times to today, as the poorly-understood fossils were imagined and brought to life as the Crystal Palace dinosaurs which are distinctly inaccurate by modern standards as the science of palaeontology has grown and drawn upon other disciplines to understand the fossils and many, many more specimens have been discovered and compared. We then proceeded on a journey through the British Mesozoic, introducing many notable British dinosaurs, many of them ground-breaking discoveries at the time. From the Isle of Skye to the Isle of Wight we encounter British dinosaurs large and small, complete and fragmentary, early to late, carnivore, herbivore and pecscivore! We travel overseas too, finding examples of British dinosaur and marine reptile fossils in far-flung corners of the globe. Indeed, Australia’s first dinosaur, Agrosaurus, later transpired to be a Thecodontosaurus fossil from Bristol! The topic of migrating fossils was prominent in Dean’s continuation into Ichthyosaurs, his personal specialism. Ichthyosaurs are not dinosaurs but marine reptiles, having a common ancestor which predates the emergence of the dinosauria. Dean’s own “evolution” as a palaeontologist is closely tied to marine reptiles through his early fieldwork in Wyoming to volunteering in his local museum and discovering an exceptional genuine fossil ichthyosaur in the collections which was thought to be a cast! Dean’s subsequent work describes a journey of hunting down “lost” British fossils hidden away in archives, small museums and overseas, re-examining them and, in two cases, recognising new species. It is a tale of caveats: many fossils are repaired, enhanced or even composites, giving the appearance of a complete specimen but being scientifically inaccurate. Once Dean had completed our journey from ancient to modern times via the Victorian, questions were invited from the audience. I’m not sure if I was more impressed by the quality and diversity of the questions from the rapt young audience or the fact that Dean could answer them all! Could T-rex jump? Probably, but if he landed badly he might struggle to right himself and a bad fall resulting in a broken limb could prove fatal so he likely didn’t risk it. I’d never considered the question and I’m fascinated by the answer! I’d like to thank Colin Tucker at the Royal Institution for sending me a ticket to the event. Dean Lomax is an internationally recognised multi-award-winning palaeontologist, science communicator and author. He has travelled the globe and worked on many fascinating projects, from excavating dinosaurs in the American West to describing new species of extinct marine reptiles. Dean is passionate about communicating palaeontology with the public and regularly appears on television, including as series advisor and expert co-presenter for ITV’s Dinosaur Britain. He has written two books, numerous scientific papers, and many popular articles. Dean is a Visiting Scientist at The University of Manchester and patron of the UK Association of Fossil Hunters (UKAFH). This entry was posted in Reports and tagged cretaceous, deanlomax, dinosaur, fossils, ichthyosaur, jurassic, mesozoic, reptile, triassic.